Wittenborg University is one of the most international institutes of higher education in the Netherlands and this is represented by its students, staff and management. Wittenborg students and staff come from around the globe, bringing international experience, knowledge and diversity to Apeldoorn and the region. Wittenborg's goal is to provide talented and motivated students from the Netherlands and around the world with a learning experience that will prepare them for management positions in business, government, profit and non-profit organisations, both within an international environment, and the local area. Wittenborg's study location in Amsterdam brings a national focus to the education it provides and its Vienna location provide its students, and the Apeldoorn region with an international dimension. Wittenborg is an international concern that expects its graduates to enter management and leadership functions in a world of international business, either in their own companies or within globally orientated companies and organisations. But whilst Wittenborg is a true global thinker, we act locally and boast strong links with companies in the S3H region of Apeldoorn, Deventer and Zutphen (Stedendriehoek). The university promotes student work experience, research projects, cultural events, and collaboration on the development of higher education programmes and initiatives for the region. By encouraging graduates to gain work experience in the Netherlands, and especially the region of Apeldoorn, Wittenborg is bringing knowledge, innovation and diversity to the S3H area. 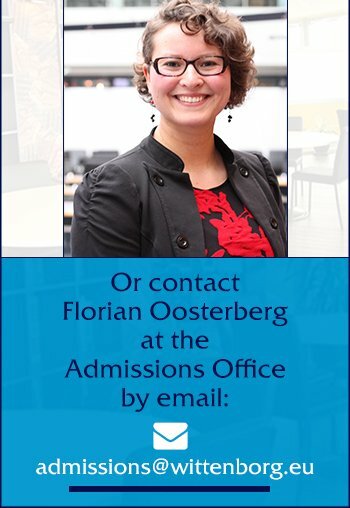 Wittenborg's educational philosophy is to stimulate real life in its approach to education, whether students are studying in Apeldoorn, Amsterdam or in Vienna. Our differentiated programme, combining traditional knowledge-based teaching with the development of skills and competencies, leads to a vocational training situation in which students can discover their strengths and weaknesses - building on the former and improving the latter. · Wittenborg students will learn to identify the environment they are in and adapt accordingly. · Wittenborg students will learn to say what they do, and do what they say.